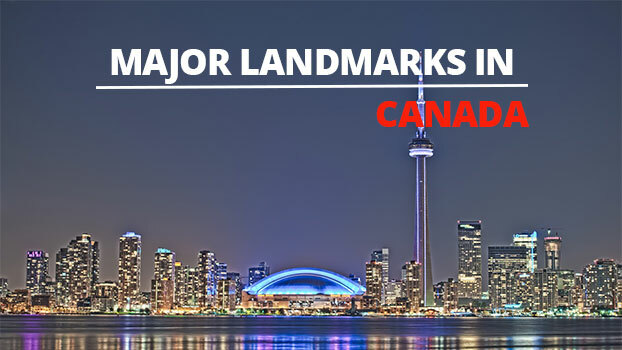 Want to view some of the most beautiful landmarks in Canada, here are our top 5 spots you must visit in Canada as a tourist or even if you already live in Canada. 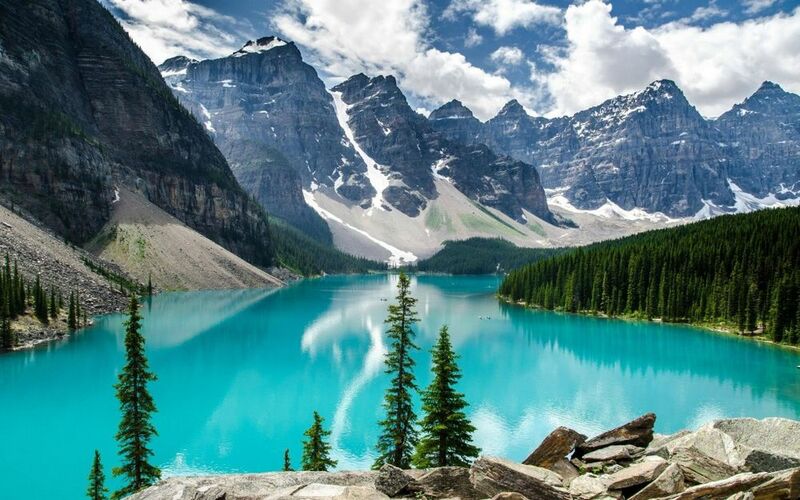 Home to some of the world’s most beautiful lakes, waterfalls and mountains, Canada is surrounded by three major oceans including the Pacific, Artic and Atlantic. Canada is the world’s second largest country and has no shortage of beauty - in fact it's in abundance! 1. Banff National Park lies right in the heart of the Rocky Mountains in Alberta. Turquoise crystal clear lakes and lush green trees reaching heavenly heights, offering a scene that is sure to take your breath away. Known for Lake Louise, there are plenty of outdoor activities to enjoy including swimming, fishing or just a peaceful stroll along the shore. In winter, Banff transforms into a major winter sports area. Lake Louise freezes over attracting skiers as it is one of Canada’s most prominent ski destinations. 2. The CN Tower situated in Canada’s biggest city of Toronto stands at 553 meters high and is one of the tallest structures in the world. The CN Tower is a communication tower with an antenna that reaches 548 meters. The CN Tower is popular for its “Edge Walk” where adventure/adrenalin seekers walk around the circumference of the roof, 356 meters above the ground. Brave enough? Once you have completed your walk, treat yourself to something to eat at the CN Tower’s restaurant, you definitely deserve it! 3. Confederation Bridge built in 1977 links to New Brunswick and Prince Edward Island. Only 8 miles long and 60 meters above sea level it’s perfect for sunset or sunrise adventures, as well as spectacular views. 4. Niagara Falls is afamous attraction that needs very little introduction and is one of the Seven Natural Wonders of the World. It attracts millions of visitors each year, producing 2,271,247 litres of water every second. Located on the border of Ontario, Canada and New York. Niagara Falls consists of 3 waterfalls namely; the American Falls, the Horseshoe Falls and the Bridal Veil Falls. These three waterfalls combined produce the highest flow rate of any waterfall on earth. For the best view, Queen Victoria Park is your best bet, with a direct view of the Falls. Tourists can also take a boat cruise aboard Maid of the Mist which takes you below the falls. 5. Hopewell Rocks is a set of uniquely formed rocks shaped by tidal erosion. 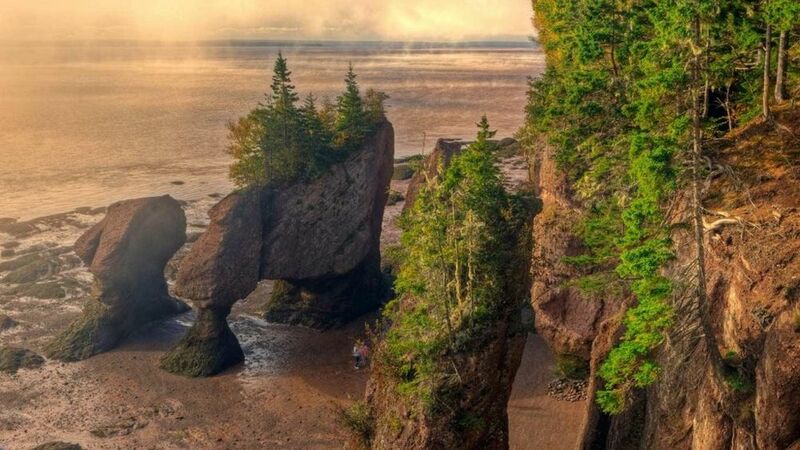 Located in theBay of Fundy in New Brunswick, this is one of the Marine Wonders of the World and holds the record for some of the world’s highest tides, reaching up to 4 storeys high at times. Hopewell Rocks has many activities including exploring the caves and taking a walk through the maze during low tide.